There were a lot of games out on the show floor during the past few days, but one that caught my eye in particular was the Avatar game that is coming out soon as a tie-in to the movie. Intended to be a prequel to the movie, and based on a third-person shooter mechanic, the game was a bit of a surprise for me. Regardless of how the movie fares, there is a great deal of potential for the game to do well; assuming, that is, that the story tie-in will leave the game with enough freedom to do its own thing and do it well. The demo I played started off with me assuming control of some fancy, semi-futuristic aircraft with dual rotor blades to keep it aloft and a whole lot of missiles to fire at any outcroppings that got in my way. There weren’t any enemies to fight; I just had to navigate my way to a landing pad while avoiding running into anything, which was fairly easy to do. Vehicle controls, at least didn’t feel loose or awkward; right trigger fired the rockets and the joysticks controlled the aircraft and camera position. The only difficulty I had was that the option to invert the controls wasn’t available in this build of the demo, so I had to readjust my thinking of which direction on the joystick was “up.” Even this early on in the demo, the visuals were absolutely stunning and made full use of the Far Cry 2 graphics engine. The area I was navigating through was a series of tall rock plateaus with vegetation hanging down and water cascading off the sides that quickly transitioned into a jungle-type environment that would be where the remainder of the demo would take place. During the entire time I played, I never noticed the slightest drop in frame rate, which is truly impressive considering what I was in store for in the jungle. 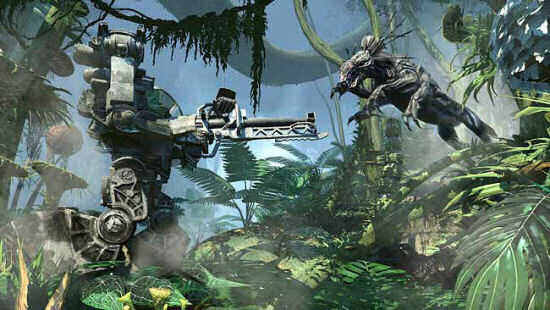 Once I was on the ground, I was placed in control of one of the Marine grunts that has come to Pandora to find minerals. The Ubisoft rep told me that, in the game, players would eventually be able to switch between the grunts and the Na'Vi, those blue cat-like creatures. I didn’t play as a Na'Vi, but for the grunt, the controls felt like a cross between Gears of War and Metroid Prime. Similar to Metroid, there is a button that allows you to scan the florae and fauna in the environment in order to gather additional data that is stored in a database you can access at any time through the menu. There wasn’t an exact number given for how many entries in the scan database there would be, but it was suggested that there was a lot to look at and scan on the planet. You could bring your weapon up to do precision aiming, or fire from the hip, and, interestingly enough, you could jump. Looks like the grunts will be doing some off-roading. The d-pad on the controller changed weapons and I could choose between an assault rifle-type weapon, a pistol, and (my personal favorite) a flamethrower. I immediately selected the flamethrower and started going scorched earth on anything and everything around me. As should be expected, all those plants around me didn’t last long and I left a few black patches of dirt in my wake. The Ubisoft rep that was standing with me told me that, in this game, if something looks pretty then it’s probably dangerous. She was right. As I approached a group of interesting and beautiful looking plants, a vine suddenly swung out and struck. This called for some fiery retribution and once I had dealt with the floral foe, I was set upon by some panther looking things that would strike, dash away into some nearby tall grass, and then strike again. A few ample applications of napalm later, I was safe once more. In addition to the 60+ weapons that will available, players will also have access to approximately 30 special skills that include healing, stealth capabilities, and speed boosts. At this point, another group of grunts showed up and we proceeded to go through the rest of the demo that included a chance to ride in a dune buggy vehicle, strap myself into a power suit (ala Aliens) that came with a machine gun, and take on a very large and very angry rhino. The appearance of a team of fellow grunts that were roughing it through the jungles with me inevitably raised the question of "so is there co-op?" The rep told me no and didn't have much else to say on it; which is a shame as Avatar has all the makings to be a great game. Without the presence of co-op, though, it’s success or failure will likely ride on whether or not its story is enough to make it an outstanding title, or just another third-person shooter. Page created in 0.9358 seconds.